Today able to give the music a modern technology? 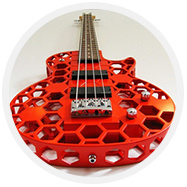 As it turned out, not only the synthesized sound of famous music, but an entirely new approach to creating musical instruments, indeed, in work connected 3D printers. the Actions of a 3D printer like the action of the machine, only the printer does not assemble parts into a whole and not carving them from a single piece of metal, and creates a whole object from scratch with only a computer model in the program and the material in liquid form for work. printer Printhead-directed program, spray layers of material in the most subtle way. These layers stiffen and fuse together in a special way, thus creating a real model. Different printers use not only a variety of print material, which may be plastic, metal, nylon, or other basis, but different technologies. print one three-dimensional model printer spends from a few minutes to several weeks. The unique tools created using three-dimensional printing? Unfortunately, even when printing of musical instruments on a 3D printer technology can make a computer model just for the case. So talking about the full creation difficult. However, the opportunity to realize the most daring ideas in unique casings and housings for tools, which actually do not lose their musical qualities, is the endless scope for expression designers and musicians. However, all is not well with the preservation of musical qualities. If the digital piano, the drums and guitars created by Olaf Digel from durable nylon, is still able to compete in sound with traditional musical instruments, here the violin from Alex Davis and flute, created at mit, alas, no. Their "voices," much less live, and notes they are clearly not available to all. But this is only the first samples that will be capable of more sophisticated brethren? At least the Creator of the flute amine Zoran intends to spend another few months on improving the model, which is assembled from three parts and is not capable of reproducing low frequencies. Do 3D engineers are very optimistic, because technology is constantly evolving. And who knows, but maybe very soon the printing of unique musical instruments that meet all the requirements of musicians, will become usual and popular. Maybe they can come up with something totally new?